There is no question more people are biking and bike commuting than ever before in the Greater Boston area including Cambridge just across the Charles River. To get an idea of just how the trend is moving, we can look to data published by the City of Cambridge, which shows 4 percent of residents commuted by bike in 1990. Today the number has risen to high as 9 percent and this is only expected to continue. To meet the needs and protect the safety of the the growing cyclist community, there have been a lot of changes including the addition of bike lanes, some with physical barriers, and there have been renewed efforts to educate motorists on the laws pertaining to bike safety. Unfortunately, there still needs to be a lot of work in both of these area as bike riders are hit by cars on a regular basis, and many drivers do not understand bike riders have the same rights as a vehicle driver while on the streets and roads of Massachusetts. 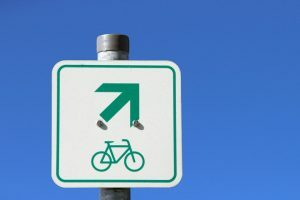 A bike rider is allowed to ride on any public way including a street, bikeway, or other public road so long as it is not a limited-access highway with signs clearly prohibiting the use of non-motorized vehicles such as bicycles. A bike rider is allowed to ride on sidewalks, which are not in business districts, unless there is a local ordinance prohibiting bike riding on sidewalks in a particular part of the city. Bike riders can use either hand to signal when turning or stopping. Bike riders are allowed to pass cars on the right. There is no set requirement for the number of lights or reflectors on a bike or rider. While these may seem like common sense, many motorists do not realize cyclists have these rights, instead viewing cyclists as a public nuisance. A recent letter to the editor from a disgruntled Cambridge resident published in Wicked Local Cambridge highlights how some still feel about bike commuters in the Greater Boston area. The author of this letter is complaining about the inconvenience he sees caused by bike lanes near his home. He has stated he relies on driving on Cambridge Street when traveling between Harvard Square and Inman Square as many people do and says he has never seen more than two riders on the bike lane at any given time. He went on to say he sees no bike riders 50 percent of the time and sometimes sees only one rider. His main issue is what he sees as seldom-used bike lanes reduce the number of parking spaces, makes the traffic patterns dangerous to motorists, and increases the cost of snow plowing and snow removal efforts. He did however, admit he has not observed these bike lanes during rush hour. There are several points to make about these complaints, which unfortunately, are too common. The first thing to understand is when we are talking about bike commuters, not looking at the numbers during rush hour cannot possibly give anyone an accurate picture about the actual level of service for a bike lane or even the road on which it is located. The next thing to understand is while there are many more bike riders who use these bike lanes than seen by the author of this letter is even if it protected a single rider a day from being involving in a serious or even fatal Boston area bike crash, their existence is well worth any cost or trouble caused. The other important issue deals with traffic patterns perceived to be dangerous to motorists. As we have seen, these lanes are not installed in a random or haphazard manner. They often take years of study, the use of traffic cameras and mechanical devices to calculate the level of service on a road, and then approval before being installed. This is actually a process which moves too slow according to many bike safety advocates. It is also a process, which still tends to favor convenience to motorists over the health and safety of bike commuters and recreational riders. If a motorist does not look out for bike riders when they are driving next to a bike lane and crashes into a bike rider, often when making a right turn, there is a good chance this accident will be attributed to lack of due care on behalf of the motorists. Just like any other negligence case involving a car crash, a motorist has the responsibility to drive in a safe and reasonable manner so as to prevent foreseeable injury to foreseeable plaintiffs including bike riders. As we have seen in far too many cases, some who are driving a car inexplicably tend to think they have right of way on a street or road over a bike rider and this is simply not the case in many situations. There are times when a motorist has right of way, but these are the same situations when a particular motorists would have right of way with respect to any other car on the road. With respect to complaints about higher street plowing costs, it should be noted that when bike lanes are installed, the road is not typically widened. Land use would simply be too high and existing buildings make this virtually impossible. Plow crews would be plowing more vehicle lanes instead of bike lanes in most cases. Even if this were a legitimate concern, the life and safety of even one bike rider should outweigh any concerns over snow removal costs.